Boston Rob uttered the above quote shortly before going to tribal council on this week’s episode. After Andrea was sent home, the question is ‘Did Boston Rob make the right decision’? The decision referred to sending Natalie to Redemption Island over Phillip. Although Andrea seemed to be the easy choice early after the immunity challenge, Phillip did his best to make sure he was not in anyone’s good graces. Chief Phillip ran around scolding the tribe, mouthing off and plain acting like an idiot. In his mind and perhaps to his credit, he’s playing the game he stumbled back in to early in the season. He insists he’s playing the crazy guy so that he’s guaranteed a spot in the finals. Phillip’s even confident enough to think that he can beat Boston Rob with the jury. As crazy as that may sound, without saying as much to Boston Rob, Phillip got the Robfather second guessing himself. That’s something that hasn’t happened all season and certainly no one would have guessed Phillip would be the one to do it. Let’s assume for a second that Phillip’s in complete control of what he’s doing and everything is a calculated effort to get himself to the finals again Boston Rob (or anyone really). Would a jury buy Phillip’s villain act and award him the one million dollars? Against Boston Rob? No. Against someone else? Maybe. Boston Rob made the right decision, but did the rest of the tribe? Grant appeared shocked when Rob suggested getting rid of Phillip, but perhaps it’s a move Grant needs to make. Or a move Natalie needs to make. Or Ashley. On one hand, getting rid of Andrea prevents her or Matt from playing together. If Matt gets back in to the game, it’ll be hard for him to avoid being quickly sent to the jury without an obvious candidate to go to for leverage. Similarly, Andrea now can’t get an ally in Matt if he had come back to build momentum herself. On the other hand, for Grant, Ashley and Natalie, they need to get rid of Phillip and Boston Rob and they only have two votes to do it. By burning a vote on Andrea, the margin for error is much thinner. If Boston Rob or Phillip wins immunity at the wrong time, you’re stuck with them in the finals. Phillip has done a lot of nutty things this season. He’s been annoying and often painful to watch. But, give him credit, he’s got a plan. Whether flawed or not, being the irritant is how he thinks he can get to the finals. What’s Grant’s plan? What’s Natalie’s plan? What’s Ashley’s plan? They really think they can win going up against Boston Rob in the finals? Couldn’t Phillip go to the finals and say that at least he played the game? Maybe he bothered everyone, but it worked. What did those three do other than ride Boston Rob’s coattails? The other major part of this episode was the family or loved one’s part, also known as a half hour of my life that I’ll never get back. At least the episode had so much to get to that we were not subject to much interaction with the loved ones. One segment and back to the game. Maybe I don’t have a soul, but season-in and season-out I simply do not care about the loved ones. Listening to Boston Rob describe his game plan to his disinterested and ignorant television is not entertaining. Beyond those loose conversations, the game completely stops when the loved ones are around. Lastly, the multi-person duels, or trials, continue to under whelm. What’s interesting about three people staying alive and one person (who basically gave up this week, thanks for coming, Steve) going home? There’s not too much drama there. I wasn’t a fan of the original format of the duels, but at least there was more on the line. 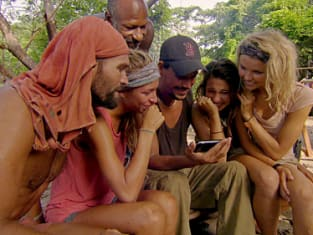 With the way the trial ended, I understand why the loved ones for those sent to Redemption Island were put in play, but otherwise those who are voted out shouldn’t get any advantages or comforts that those not voted out get. I believe Mike when he says that he didn’t give up time with his mother so that the most people could have time with their loved ones for strategic reasons. However, I think that subconsciously it impacted his decision. Ralph being angry with that decision was stupid. Get over yourself. Awesome challenge this week. I wish we could have more challenges that are so…challenging. Of course, they favor physicality, so they can’t run one like that every week. Jeff is unabashedly egging Phillip on to say ridiculous things about his Federal Agent training or his great grandfather.